Who doesn't have a bunch of souvenir t-shirt?! They make great memory quilts. 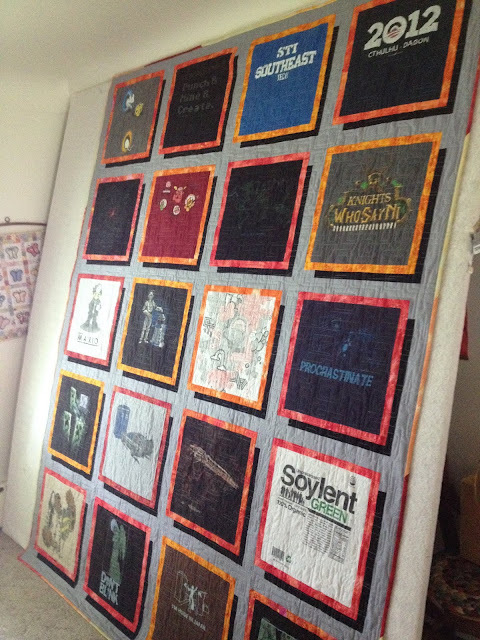 These are t-shirt quilts I've made over the past 3 years. 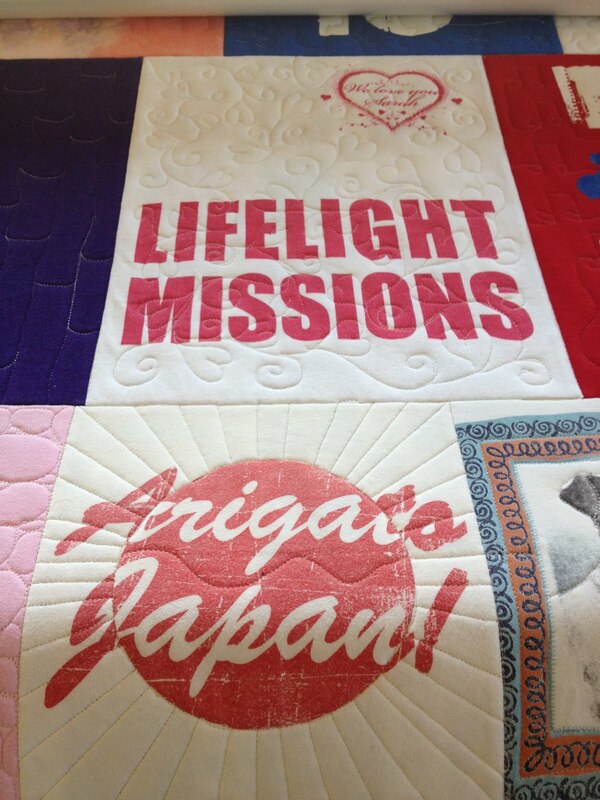 This quilt was requested by Lori. 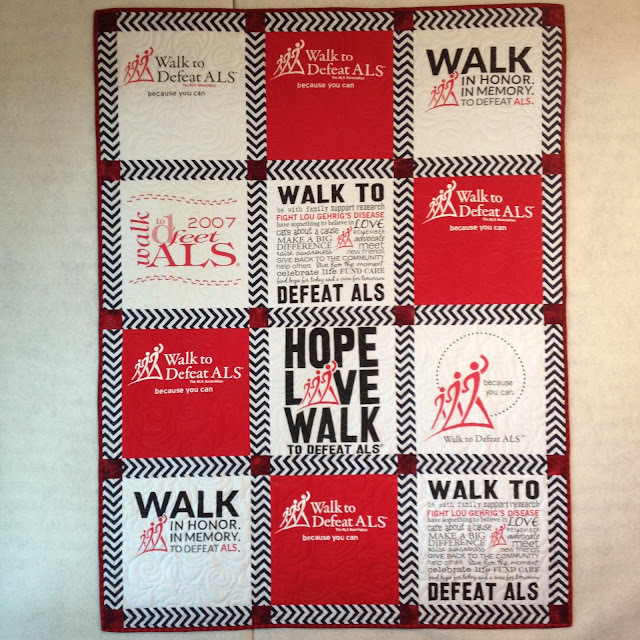 It was a raffle quilt that raised money for helping families living with ALS in the Sioux Falls area. 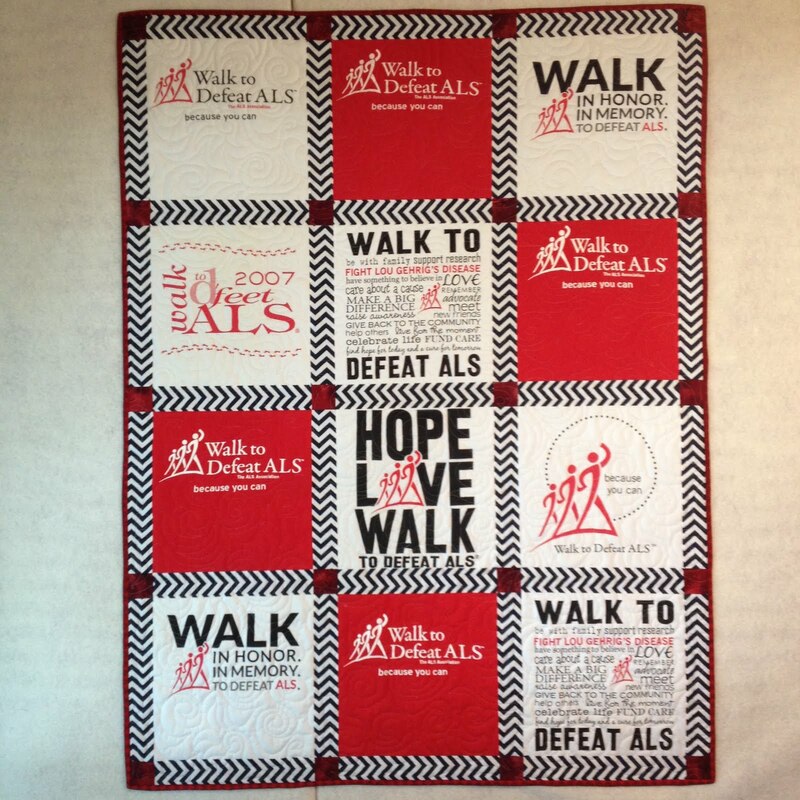 Lori does all kinds of volunteer work related to ALS and is part of the Walk to Defeat ALS in Sioux Falls every fall. 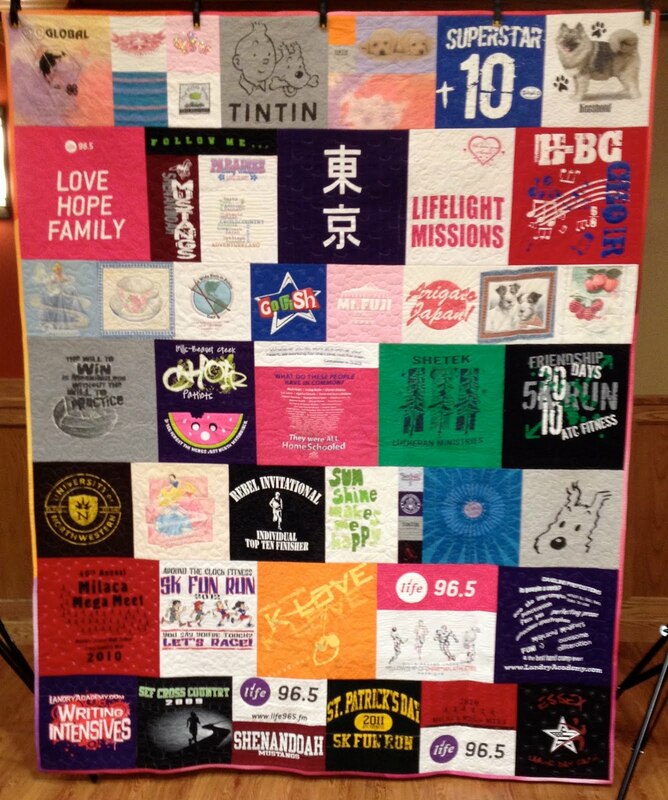 From more t-shirts she had, Lori had me make this t-shirt quilt for her. She lost her husband to ALS, so she knows what it's like. 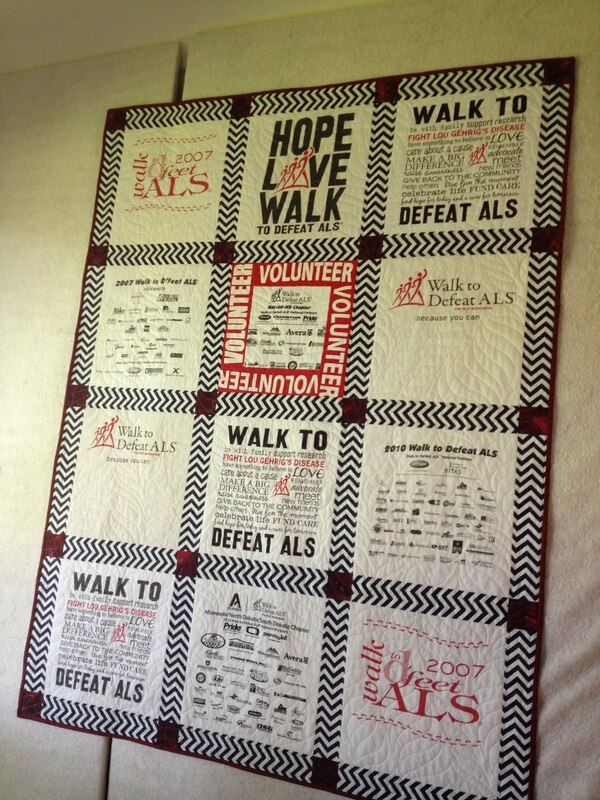 She has passion and compassion for helping families fighting ALS. 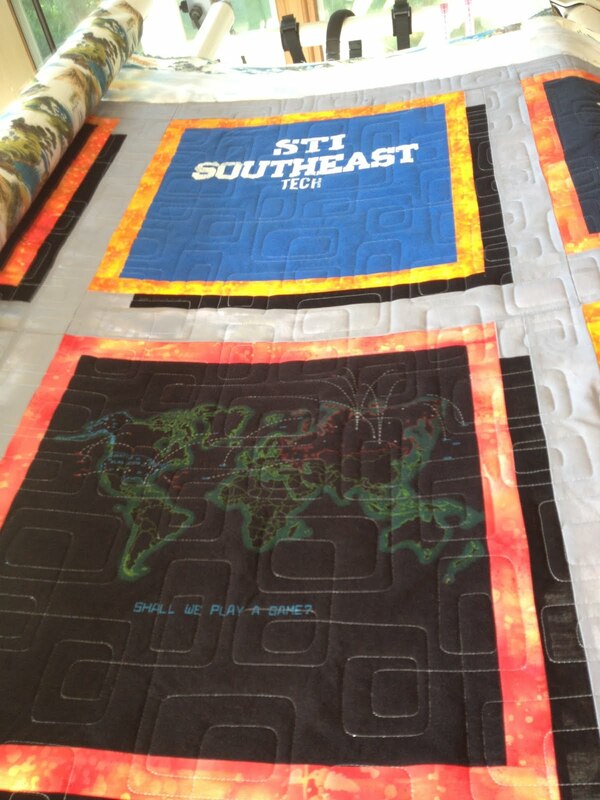 I made this queen size t-shirt quilt for our son. I love how the squares look like they're floating, with a shadow behind them. I saw a quilt like this on Pinterest and made it up from there. 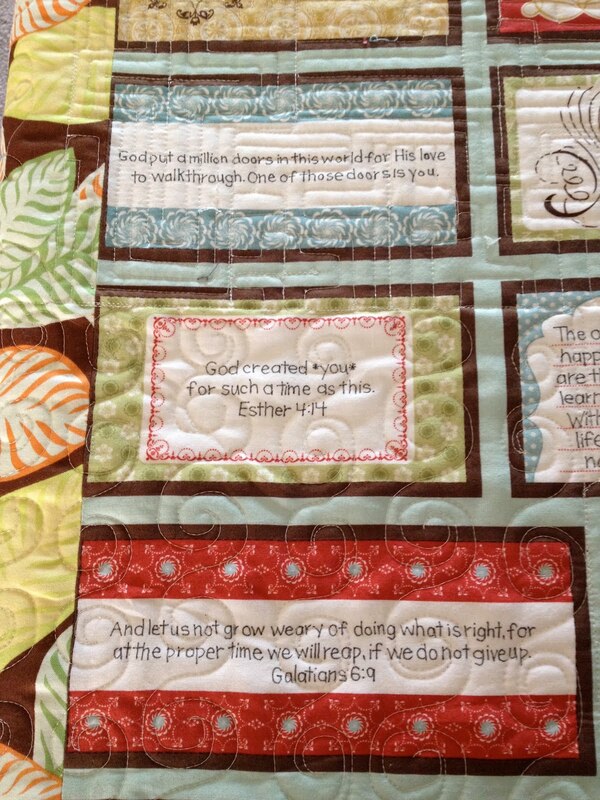 I quilted it with an edge-to-edge--"Bauhaus". And this one is for our DD2, Susanna, for her high school graduation. It has a total of 45 t-shirts in it! She has t-shirts in here from her youngest years all the way through her high school days. Some are from the years we lived in Japan. For her, that was from 9 months old through 11 years old. 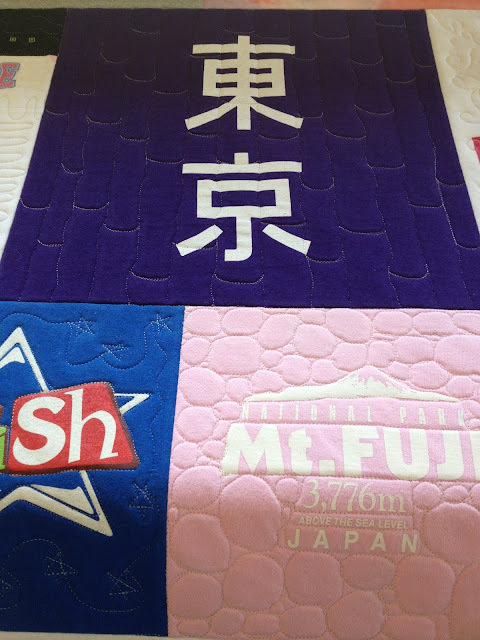 I quilted each t-shirt square with a different freehand motif, inspired by the t-shirt logo. For part of the backing, I purchase 2 yards of label fabric and wrote messages to her, things I want her to think on and remember. The more one looks at these saying, the more they sink in and we remember to live them and are encouraged by them. It's been 2 years since her high school graduation and she is making another t-shirt quilt for herself from t-shirts she's gotten since then. Yes, there seems to be a never ending supply of t-shirts! T-shirt quilts are a great way to hold on to memories. Linking to Confessions of a Fabric Addict--Can I Get a Whoop, Whoop?! 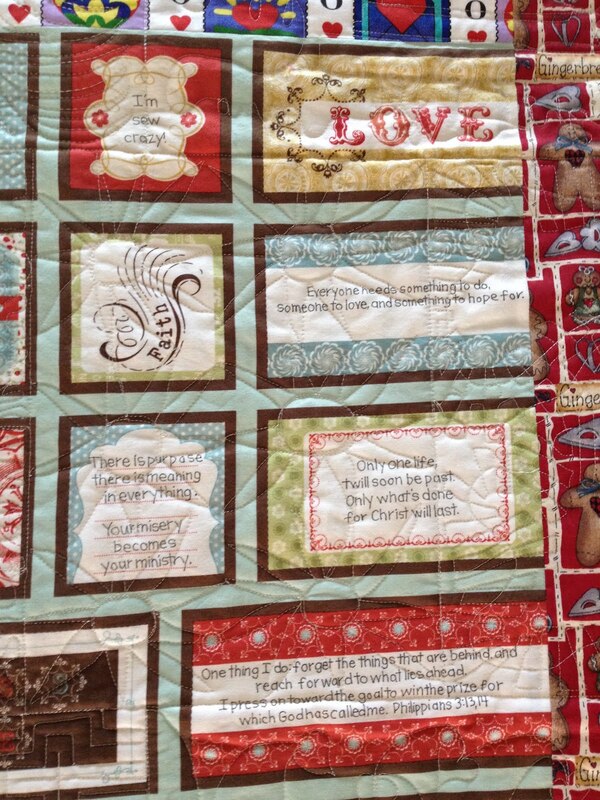 and Crazy Mom Quilts--Finish It Up Friday. I agree, I've made several tee shirt quilts over the years. The first was for DH for a major birthday, using all the tee shirts he was hanging on to. 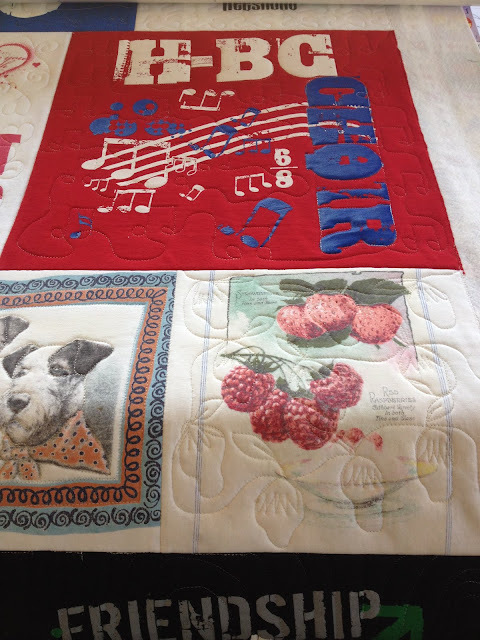 The others, sadly, have been memory quilts when friends had passed away. Using tee shirts, work shirts, buttons and labels, whatever was given to me in the bag. But it was a priviledge to make them to, and return them to the grieving partners left behind. Thank you for your comment, Jenny! That must be quite a t-shirt quilt for your DH. That was a kind thing you've done, to make memory quilts for your friends. Thanks, Rachel! 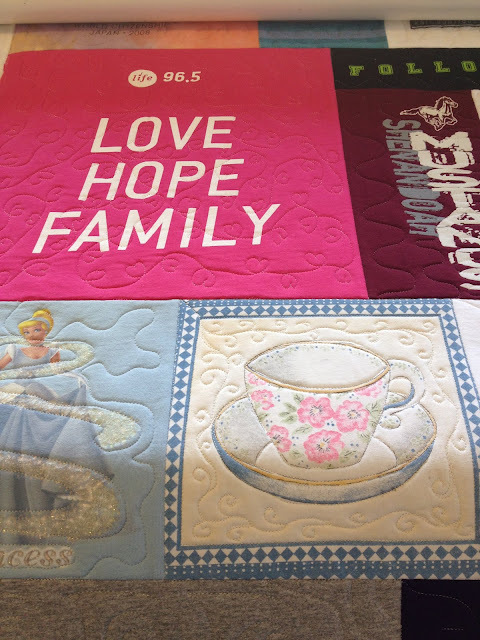 My tip for making a t-shirt quilt is this--buy thin, lightweight iron-on interfacing. T-shirt quilts become heavy, so lightweight interfacing is the way to go. Approximately 1/2 yard per t-shirt. Go for the inexpensive stuff--it's going to be in the middle after all. Good luck!